Many Android-powered devices include built-in sensors that measure motion, orientation, and environmental conditions such as ambient light or temperature. These sensors can provide data to your app with high precision and accuracy. Sensors can be used to monitor three-dimensional device movement or positioning, or to monitor changes in the environment near a device, such as changes to temperature or humidity. For example, a game might track readings from a device&apos;s accelerometer sensor to infer complex user gestures and motions, such as tilt, shake, or rotation. In this practical you learn about the Android sensor framework, which is used to find the available sensors on a device and retrieve data from those sensors. The device camera, fingerprint sensor, microphone, and GPS (location) sensor all have their own APIs and are not considered part of the Android sensor framework. Running and testing apps with the Android emulator. Query the sensor manager for available sensors, and retrieve information about specific sensors. Register listeners for sensor data. React to incoming sensor data. Create an app that lists the available device sensors. Run the app on a device and on the emulator to view sensors. Create a second app that gets data from the light and proximity sensors, and displays that data. Interact with the device and note the changes in sensor data. Run the app in the emulator and learn about the emulator&apos;s virtual sensors. You will build two apps in this practical. The first app lists the available sensors on the device or emulator. 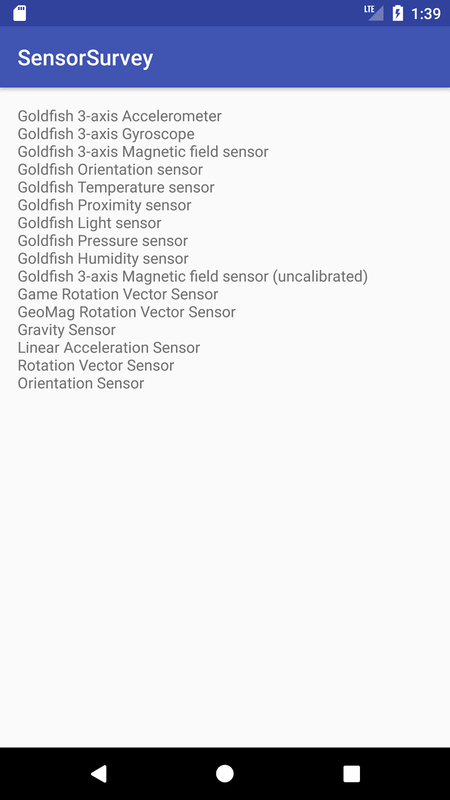 The list of sensors is scrollable, if it is too big to fit the screen. The second app, modified from the first, gets data from the ambient light and proximity sensors, and displays that data. Light and proximity sensors are some of the most common Android device sensors. In this task, you build a simple app that queries the sensor manager for the list of sensors available on the device. Create a new Android project. Call it SensorSurvey and use the Empty activity template. Add a margin of 16 dp to the constraint layout. The ScrollView is here to allow the list of sensors to scroll if it is longer than the screen. The sensor manager is a system service that lets you access the device sensors. The Sensor class represents an individual sensor and defines constants for the available sensor types. The Sensor.TYPE_ALL constant indicates all the available sensors. Different Android devices have different sensors available, which means the SensorSurvey app shows different results for each device. 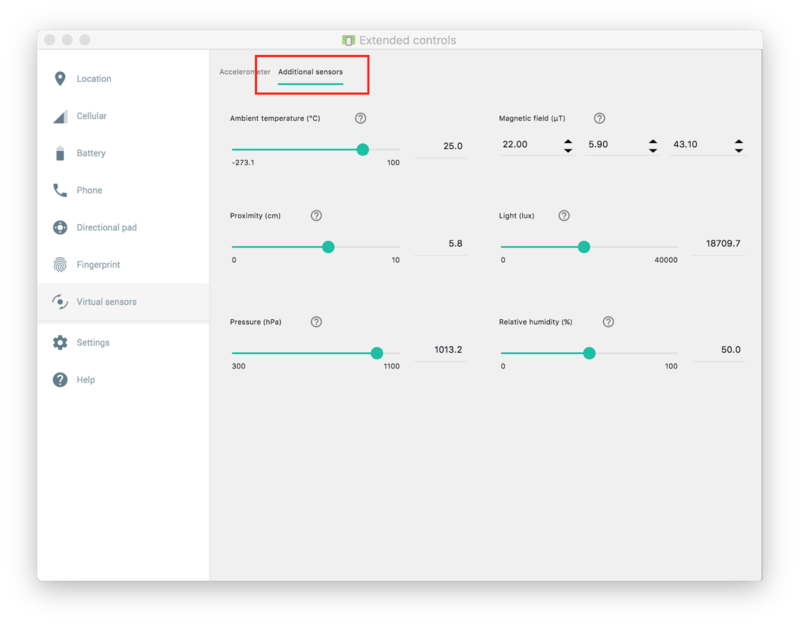 In addition, the Android emulator includes a small set of simulated sensors. In this list, lines that begin with a letter/number code represent physical hardware in the device. The letters and numbers indicate sensor manufacturers and model numbers. In most devices the accelerometer, gyroscope, and magnetometer are physical sensors. Lines without letter/number codes are virtual or composite sensors, that is, sensors that are simulated in software. These sensors use the data from one or more physical sensors. So, for example, the gravity sensor may use data from the accelerometer, gyroscope, and magnetometer to provide the direction and magnitude of gravity in the device&apos;s coordinate system. 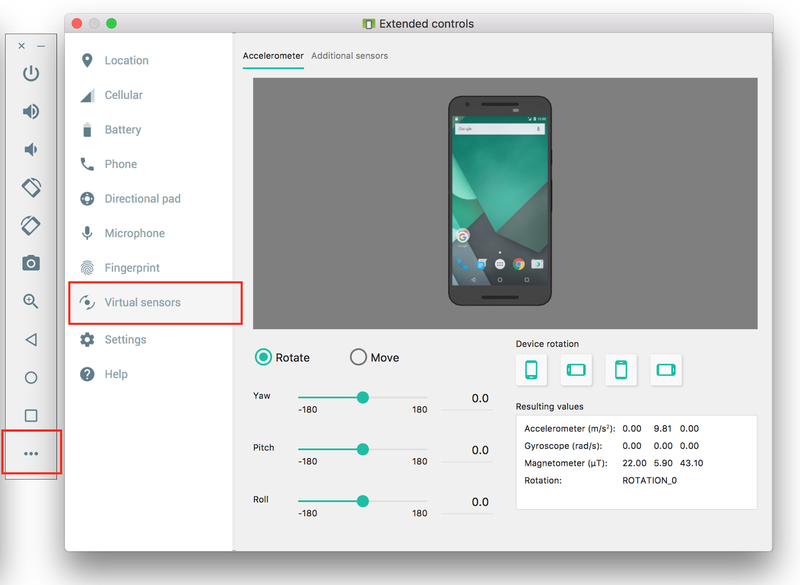 Because the Android emulator is a simulated device, all the available sensors are virtual sensors. "Goldfish" is the name of the emulator&apos;s Linux kernel. Click the More button (three horizontal dots) on the emulator&apos;s control panel. The Extended Controls window appears. This window shows the settings and current values for the emulator&apos;s virtual sensors. Drag the image of the device to simulate motion and acceleration with the accelerometer. Dragging the device image may also rotate the main emulator window. Click the Additional Sensors tab. This tab shows the other available virtual sensors for the emulator, including the light, temperature, and proximity sensors. You use more of these sensors in the next task. The Android sensor framework provides the ability for your app to register for and react to changes in sensor data. In this task you modify your existing app to listen to and report values from the proximity and light sensors. The light sensor measures ambient light in lux, a standard unit of illumination. The light sensor typically is used to automatically adjust screen brightness. The proximity sensor measures when the device is close to another object. The proximity sensor is often used to turn off touch events on a phone&apos;s screen when you answer a phone call, so that touching your phone to your face does not accidentally launch apps or otherwise interfere with the device&apos;s operation. Delete the ScrollView and TextView elements from the previous app. Add a TextView and give it the attributes in the following table. Extract the string into a resource called "label_light". This text view will print the current value from the light sensor. 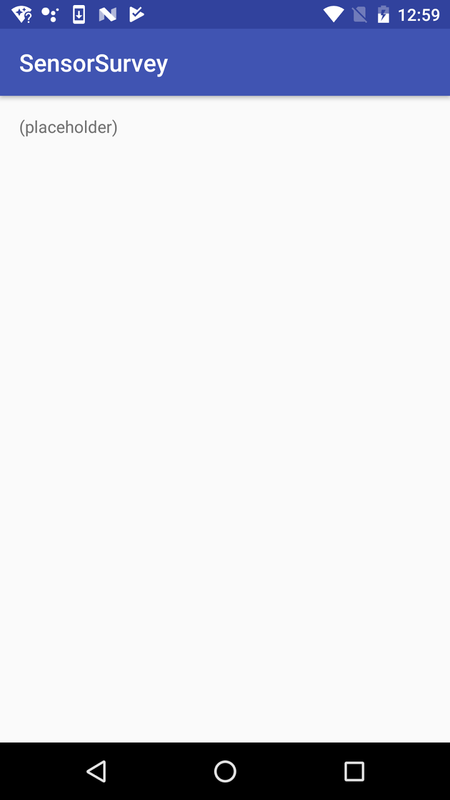 %1: The first placeholder. You could include multiple placeholders in the same string with %2, %3, and so on. $.2: The number format. In this case, .2 indicates that the value should be formatted with only two digits after the decimal point. f: Indicates that the value to display is a floating-point number. Use s for string values and d for decimal values. The part of the string that is not made up of placeholders ("Light Sensor: ") is passed through to the new string. You can find out more about placeholders and formatting codes in the Formatter documentation. Copy and paste the TextView element. Change the attributes in the following table. Extract the string into a resource called "label_proximity". This text view will print values from the proximity sensor. You&apos;ll use this message in the next task when you test if a sensor is available. In this task, you modify the activity&apos;s onCreate() method to gain access to the light and proximity sensors. // Individual light and proximity sensors. In the onCreate() method, delete all the existing code after the line to get the sensor manager. The getDefaultSensor() method is used to query the sensor manager for sensors of a given type. The sensor types are defined by the Sensor class. If there is no sensor available for the given type, the getDefaultSensor() method returns null. Test that there is an available light sensor. If the sensor is not available (that is, if getDefaultSensor() returned null), set the display text for the light sensor&apos;s TextView to the error string. Different devices have different sensors, so it is important that your app check that a sensor exists before using the sensor. If a sensor is not available, your app should turn off features that use that sensor and provide helpful information to the user. If your app&apos;s functionality relies on a sensor that is not available, your app should provide a message and gracefully quit. Do not assume that any device will have any given sensor. Test for the existence of the proximity sensor. When sensor data changes, the Android sensor framework generates an event (a SensorEvent) for that new data. Your app can register listeners for these events, then handle the new sensor data in an onSensorChanged() callback. All of these tasks are part of the SensorEventListener interface. In this task, you register listeners for changes to the light and proximity sensors. You process new data from those sensors and display that data in the app layout. At the top of the class, modify the class signature to implement the SensorEventListener interface. Click the red light bulb icon, select "implement methods," and select all methods. onSensorChanged(): Called when new sensor data is available. You will use this callback most often to handle new sensor data in your app. 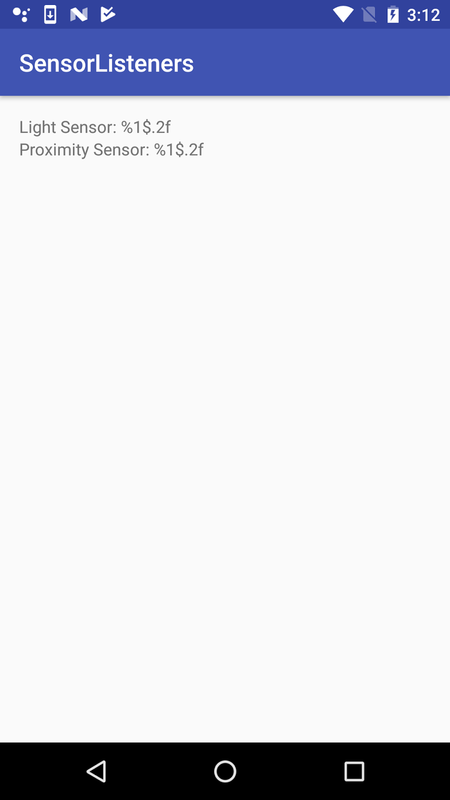 onAccuracyChanged(): Called if the sensor&apos;s accuracy changes, so your app can react to that change. Most sensors, including the light and proximity sensors, do not report accuracy changes. In this app, you leave onAccuracyChanged() empty. Override the onStart() activity lifecycle method to register your sensor listeners. Listening to incoming sensor data uses device power and consumes battery life. Don&apos;t register your listeners in onCreate(), as that would cause the sensors to be on and sending data (using device power) even when your app was not in the foreground. Use the onStart() and onStop() methods to register and unregister your sensor listeners. Note: The onStart() and onStop() methods are preferred over onResume() and onPause() to register and unregister listeners. As of Android 7.0 (API 24), apps can run in multi-window mode (split-screen or picture-in-picture mode). Apps running in this mode are paused, but still visible on screen. Use onStart() and onStop() to ensure that sensors continue running even if the app is in multi-window mode. An app or activity Context. You can use the current activity (this) as the context. The Sensor object to listen to. A delay constant from the SensorManager class. The delay constant indicates how quickly new data is reported from the sensor. Sensors can report a lot of data very quickly, but more reported data means that the device consumes more power. Make sure that your listener is registered with the minimum amount of new data it needs. In this example you use the slowest value (SensorManager.SENSOR_DELAY_NORMAL). For more data-intensive apps such as games, you may need a faster rate such as SENSOR_DELAY_GAME or SENSOR_DELAY_FASTEST. A single call to the SensorManager.unregisterListener() method unregisters all the registered listeners. Unregistering the sensor listeners in the onStop() method prevents the device from using power when the app is not visible. In the onSensorChanged() method, get the sensor type. The onSensorChanged() method is called with a SensorEvent object. The SensorEvent object includes important properties of the event, such as which sensor is reporting new data, and the new data values. Use the sensor property of the SensorEvent to get a Sensor object, and then use getType() to get the type of that sensor. Sensor types are defined as constants in the Sensor class, for example, Sensor.TYPE_LIGHT. Also in onSensorChanged(), get the sensor value. The sensor event stores the new data from the sensor in the values array. Depending on the sensor type, this array may contain a single piece of data or a multidimensional array full of data. For example, the accelerometer reports data for the x -axis, y -axis, and z -axis for every change in the values, values, and values positions. Both the light and proximity sensors only report one value, in values. Add a switch statement for the sensorType variable. Add a case for Sensor.TYPE_LIGHT to indicate that the event was triggered by the light sensor. // Event came from the light sensor. Inside the light sensor case, get the template string from the resources, and update the value in the light sensor&apos;s TextView. When you call getString() to get the string from the resources, you include values to substitute into the string where the placeholder codes are. The part of the string that is not made up of placeholders ("Light Sensor: ") is passed through to the new string. Add a second case for the proximity sensor (Sensor.TYPE_PROXIMITY). Move the device towards a light source, or shine a flashlight on it. Move the device away from the light or cover the device with your hand. Note how the light sensor reports changes in the light level. TIP: The light sensor is often placed on the top right of the device&apos;s screen. The light sensor&apos;s value is generally measured in lux, a standard unit of illumination. However, the lux value that a sensor reports may differ across different devices, and the maximum may vary as well. If your app requires a specific range of values for the light sensor, you must translate the raw sensor data into something your app can use. Move your hand toward the device, and then move it away again. Note how the proximity sensor reports values indicating "near" and "far." Depending on how the proximity sensor is implemented, you may get a range of values, or you may get just two values (for example, 0 and 5) to represent near and far. TIP: The proximity sensor is often a virtual sensor that gets its data from the light sensor. For that reason, covering the light sensor may produce changes to the proximity value. As with the light sensor, the sensor data for the proximity sensor can vary from device to device. Proximity values may be a range between a minimum and a maximum. More often there are only two proximity values, one to indicate "near," and one to indicate "far." All these values may vary across devices. Run the app in an emulator, and click the More button (three horizontal dots) on the emulator&apos;s control panel to bring up the Extended controls window. Click Virtual sensors, and then click the Additional sensors tab. The sliders in this window enable you to simulate changes to sensor data that would normally come from the hardware sensors. Changes in this window generate sensor events in the emulator that your app can respond to. Move the sliders for the light and proximity sensors and observe that the values in the app change as well. The background color of the app changes in response to the light level. TIP: You can use getWindow().getDecorView().setBackgroundColor() to set the app&apos;s background color. Place an ImageView or Drawable in the layout. Make the image larger or smaller based on the value that the app receives from the proximity sensor. The Android sensor framework provides access to data coming from a set of device sensors. These sensors include accelerometers, gyroscopes, magnetometers, barometers, humidity sensors, light sensors, proximity sensors, and so on. The SensorManager service lets your app access and list sensors and listen for sensor events (SensorEvent). The sensor manager is a system service you can request with getSystemService(). The Sensor class represents a specific sensor and contains methods to indicate the properties and capabilities of a given sensor. It also provides constants for sensor types, which define how the sensors behave and what data they provide. 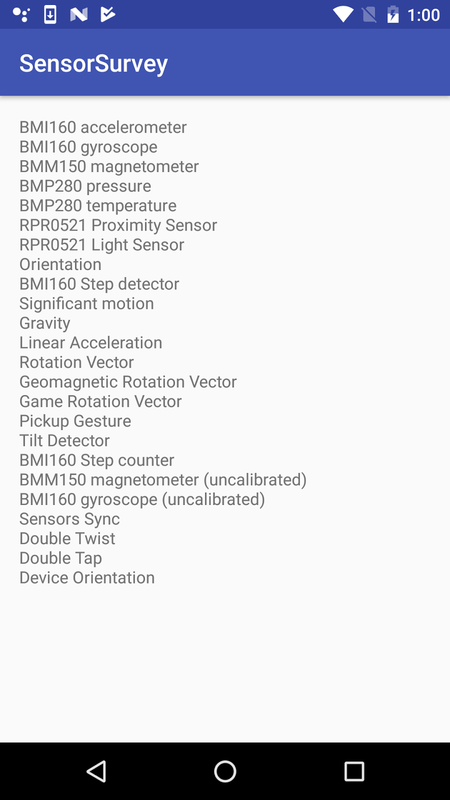 Use getSensorList(Sensor.TYPE_ALL) to get a list of all the available sensors. Use getDefaultSensor() with a sensor type to gain access to a particular sensor as a Sensor object. Sensors provide data through a series of sensor events. A SensorEvent object includes information about the sensor that generated it, the time, and new data. The data a sensor provides depends on the sensor type. Simple sensors such as light and proximity sensors report only one data value, whereas motion sensors such as the accelerometer provide multidimensional arrays of data for each event. Your app uses sensor listeners to receive sensor data. Implement the SensorEventListener interface to listen for sensor events. Use the onSensorChanged() method to handle individual sensor events. From the SensorEvent object passed into that method, you can get the sensor that generated the event and the new data. Register the sensor listeners in the onResume() lifecycle method, and unregister them in onPause(). Doing this prevents your app from drawing system resources when your app is not in the foreground. Use the registerListener() method to listen to sensor events. Listener registration includes both the type of sensor your app is interested in, and the rate at which your app prefers to receive data. A higher data rate provides more data events, but uses more system resources. Use the unregisterListener() method to stop listening to sensor events. The related concept documentation is in Sensor Basics.